A popular concern of Georgia fans heading into Saturday’s game against Georgia Tech is the Bulldogs offense as managed by new starter Hutson Mason. Interestingly, that concern is not so much a reflection of fan sentiment regarding Mason’s capabilities, but rather a fear of a limited Georgia playbook. Georgia was forced to limit the playbook when young guys were filling in for injured stars Malcolm Mitchell, Michael Bennett, Justin Scott-Wesley, Todd Gurley and Keith Marshall. As a result, the Dawgs’ typically potent offensive attack struggled for much of the middle portion of the season against the like of Tennessee, Missouri and Vanderbilt. The red and black faithful are fearful of a stagnant, un-creative and conservative offense. And for what it’s worth, Georgia defensive lineman Garrison Smith has a great deal of confidence in Mason. After telling Dowdle that Mason is a “hell of a quarterback,” he went so far as to compare the new man under center to Peyton Manning. Let’s hope both Richt and Smith are right. All week I’ve been inundated with taunting and teasing by Tech fans who are understandably hyped up for this weekend’s game. I’ve become friends with numerous people who are Tech fans, Tech grads, and Tech football alumni, but as I’ve told them all week, I will never REALLY look forward to this game like our EIC. Personally, I can trace it back to my high school offensive coordinator and o-line coach Joe Koch who implemented a double screen our junior year out of an empty set. The screen to the three receiver side was called Tech and the screen to the two receiver side was called Georgia because, as he said, “It takes three Tech recruits to equal two Georgia recruits.” It was funny then, but it’s even truer now. Every time this year after a Georgia loss, you see twitter littered with the Tech faithful dropping the #THWG. Meanwhile, this is the first time I’ve mentioned Tech on this site, and I can’t tell you what games they’ve lost this year because I genuinely do not care. I’ve explained the reasons why the triple option offense is bad for the Jackets to all my Tech affiliated friends who will listen, but since we’re here, I’ll entertain you on this turkey day as to why Tech’s dedication to this offense is not only bad for the short-term, but sets the program back years. Paul Johnson’s offense requires a certain skill set in not only the backfield, but also a very specific type of offensive lineman. Cut first, smaller linemen are recruited, and because these are players not accustomed to either pure run blocking or pass blocking, it limits what can be done by the whole offense. Similarly, the offensive mentality precludes them from recruiting elite passers or receivers, and when the quality of recruits at those positions drop off, it affects the national perception of the program which hinders recruiting further. A lot of the people I have talked to have admitted that Paul Johnson isn’t a long-term solution as a coach in Atlanta, but whoever inherits a squad of undersized linemen, one-dimensional quarterbacks, and less than elite receivers is in for a rough transition. But hey! I like that the Tech rivalry has transformed into an annual beating, and would like to see the triple option tradition continue as the offense catches teams off guard, but against elite athletes is easily nullified. PAUL JOHNSON COACH FOR LIFE! Even Wikipedia knows what’s up. Here be the picks. Enjoy your turkey day. Home teams, as always, in bold. I have a confession to make: I don’t hate Georgia Tech. I really don’t. While Chad “The Intern” Floyd makes stellar points, few of which I disagree with, I can’t muster up enough emotion to actually hate Georgia Tech. I know I’m supposed to hate Tech and I’ve earnestly tried. But I’m just not there. Maybe it’s because Georgia Tech has won just six football games against the Bulldogs since I was born. Maybe it’s because the Yellow Jackets have defeated the Bulldogs just once in the past dozen tries. Maybe it’s because Georgia Tech’s best season of the past 20 years (an 11-win 2009 effort that put the Jackets, the ACC Champs, in a BCS Bowl) was crowned with a home loss to a mediocre Georgia tem led by the likes of Joe Cox and Washaun Ealey. I just don’t hate Tech. To be clear: I’m not a Bulldog homer of the “Tech can never touch us” variety. I’m not too ignorant to hate Tech, I’m just too uninterested. At any given time, the Jackets can make a run (or 55 runs as Paul Johnson would have it) and take down the Bulldogs. I saw it firsthand in 2008 when Reshad Jones and company forgot how (or refused) to tackle. It’s always possible. If ever there was a year for a Tech win, surely this is it. Georgia’s defense boasts the youth and inexperience that is the very antithesis of the discipline it takes to stop Johnson’s option rushing attack. Offensively, Hutson Mason is replacing Aaron Murray (a 52-game starter and the best passer in SEC history) and Malcolm Mitchell, Justin Scott-Wesley, Keith Marshall and Jay Rome are still injured. Tech is playing at home, Georgia is rebuilding in its 12th game of the season. But, if I’m brutally honest, I don’t really care if Georgia Tech beats Georgia on Saturday. If the Jackets win, it won’t begin to register on the scale of disappointment that this season has framed. Losses to Clemson, Missouri, Vanderbilt and Auburn hurt much more than a hypothetical loss to Georgia Tech. Losing (at some point or another) to injury the Dawgs’ top two running backs, top five wide receivers, backup tight end, starting quarterback and two starting safeties hurts much more than a loss to Georgia Tech. And in fairness, wins over the likes of South Carolina, LSU and Florida established a hell of a lot more goodwill than a loss to Tech could destroy. In some regards, a loss to Tech might actually be a good thing…at least for me. Maybe it would induce me to care a little more about this rivalry. Maybe a loss would prove more painful than I anticipate, and I could soon begin to foster some dislike for the Yellow Jackets. Maybe it would make me hate Tech, the way I’m supposed to. Does even casually alluding to a loss to Tech make me a bad Georgia fan? That’s for you to decide. But, if at any point over the past five days you’ve thought, “I hate what happened to Murray, but I’m glad Mason is going to get more reps with the first team and a few starts under his belt before next year,” then you can’t judge me. I’m willing to accept a loss to Tech for the sake of renewing a rivalry in the same way that you’re willing to root for Mason in hopes of a stronger 2014. I’m in favor of strengthening rivalries, and right now Georgia and Georgia Tech fans aren’t even playing on the same field. 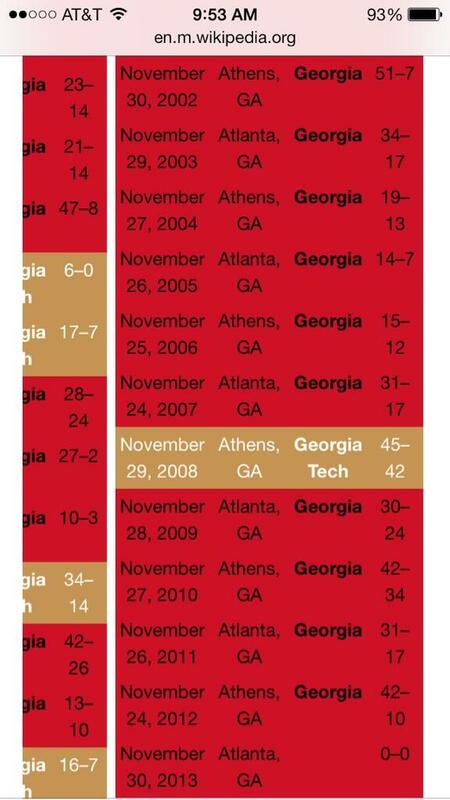 Most Tech fans would just as soon see Georgia lose on any given Saturday as see the Yellow Jackets win. In contrast, I actually root for Georgia Tech 11 weekends per year. I like seeing local teams succeed. I’m cheering for Georgia on Saturday. I’m hoping Georgia wins. I think Georgia will win. But if the Georgia Tech Yellow Jackets manage to defeat a depleted Georgia team, I’m not going to be devastated. Maybe that will make this rivalry, which is so desperately devoid of parity, meaningful. The opposite of love is not hate; it’s indifference. I think that’s in a movie or a song or a book somewhere. I don’t hate Georgia Tech. But I couldn’t be more indifferent. More than Florida, Auburn, or Tennessee, I hate Georgia Tech. Not because they’ve been nationally relevant, regionally relevant, or even good. They just bother me. This is a school located right in the center of one of the finest cities in America, and it has NO PRESENCE outside of the occasional “Tech Alumni” license plate frame. Thing is, while I hate Tech, I also get to laugh at them. Bobby Dodd Stadium is the worst stadium in which I’ve ever attended a game. For an engineering school, it would stand to reason that the concourses would be wider than 12 feet and higher than 8. I’ve never seen that ridiculous endzone upper deck, which is the largest section of the stadium (not a sideline one), approach capacity. Sitting in a box overlooking the student section at this year’s game, I counted 13 girls in the entire student section. Oh, and their halftime show was a tribute to math. Math. The jokes write themselves. Said another way, open the whole playbook to Hutson Mason and play as if #11 is still back there. I have nightmares of not attempting a shot downfield until a desperation Hail Mary against Vanderbilt, and I’m worried about Mike Bobo trying to ‘ease’ Mason into the game. The opposite must be done. Come out aggressively. I recall a no-huddle attack marching down the field in Athens against a shellshocked Tech D last year, and taking them out of the game by the end of the first quarter. Do the same thing this year, as Tech’s Vad Lee (or, their high school offense in general) doesn’t play from behind very well. In ACC play, Clemson, Miami, and Virginia Tech have had success taking away the dive on Tech’s triple option and playing disciplined, match-up football with the ends and outside LB’s, which is exactly how you defend it. The success for those teams is accented when Lee misses the read and hands off on the dive anyway, creating a 2nd and 10-13. Todd Grantham has had success doing this in the past. However, with this young defense, I’m concerned about going against an offense where defensive discipline is paramount. From point #1, an early lead will help, as a one-handed offense (haven’t used that term in awhile!) will have to play left-handed (i.e. pass when they’ve thrown for a total of 1316 yards all year (said another way, Vad Lee’s season high of 189 yards would be Aaron Murray’s third-worst of the season, including the Kentucky game). Seriously, with Murray out, Tech fans have come out of the woodworks and are convinced this is their year this decade to beat the Dawgs. But, no. This part is a joke. Account for Paul Johnson’s desperation by watching your back on punt situations, take the crowd out early, and hang about 60 points. I love Senior Day. Selfishly, it reminds me of every one of those I’ve had, but not-as-selfishly, it gives a program a chance to thank those who have poured (literal) blood, sweat and tears into a team and worked their damnedest to leave a school and a team better than they found it. Much has been written (and will be written) about the dedication and talents on Aaron Murray, but I want to take a second and thank all 28 Seniors, from the first day draft picks, to the special teams player, to the back up who helped prepare the team during the week, for their time, their passion, and their dedication to Georgia. – Quarterbackery. Aaron Murray is now the only SEC quarterback to pass for over 3,000 yards for 4 straight years. And while his exit from the game was what NO ONE wanted, quarterback-in-waiting Hutson Mason acquitted himself nicely in his first meaningful snaps, and gave us an early look at the foreseeable future of this Georgia offense. And, given everything that is coming back next year, the future is bright. – Running game. Totaling 230 yards on 40 carries, the Gurley led running back corps looked the best they had all season, as Todd averaged 9.6 a carry, and looked healthier than he has since that LSU game against UK. Some of the success has to be attributed to an outgunned Wildcat defense, but both JJ Green and Brandon Douglas looked good, and will be great complimentary pieces around Gurley and a returning Keith Marshall next year. – Defense. They barely allowed 200 yards total to a Kentucky team that has historically played Georgia well, and their success against the run this week after the let down against Auburn has me energized going into the game against that team in Atlanta. – Yeah, even I’m not nit picky enough to complain about this one. – You already know. I have fallen into the bad habit of talking about next year in this edition of Knee Jerk Reactions, and trust me, I recognize there are two more games that matter a great deal to this Georgia team. But, with Aaron Murray having suited up for the final time, and ending his days in Athens tied for the most games started at quarterback with David Greene, and more than a few Georgia and SEC records in his pocket, last Saturday feels a lot like the end of an era. It’s the last time we get the pleasure of seeing number 11 lace them up in the Georgia red, but I know this group will not let everything they have built go by the wayside over these next two games. This is the time of year that everyone waxes philosophic about the season as a whole, and I’m no different. I’m glad these seniors got to leave their home field as winners, and know that their careers will be defined as Champions, as no one can take the two SEC East Titles from them. Anyone who tells you that these titles don’t matter never laced up the cleats on Saturday. Of course they wanted more, but their successes on and off the field can not be overstated. 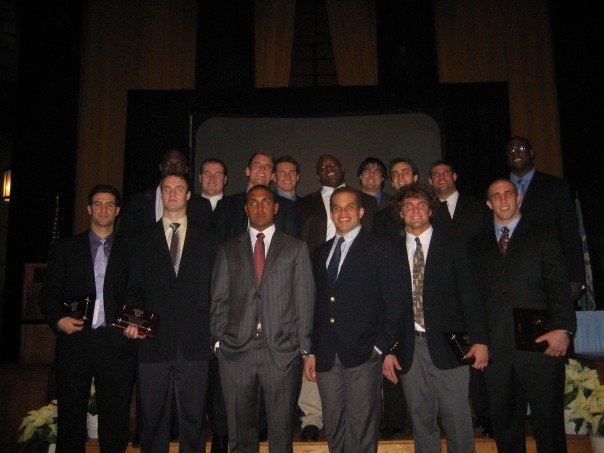 In the spirit of getting sappy and reflective, I am using the end of this blog to tip my cap to a group that will always mean the world to me, Columbia Football Class of 2007. Together, we left our home field for the last time as winners, and a week later, ended our careers as collegiate football players as winners as well. I hope these Georgia seniors get that same feeling. Go Dawgs, and Roar Lion Roar.